An Arlington, Mass., theater troupe performs the stories of ordinary people. Recently, John told me about an unusual improvisational theater group that will perform your story. Called True Story Theater, it is affiliated with the worldwide Playback Theatre movement, which seeks to right wrongs experienced by minorities and marginalized groups by putting their actual words into plays to build understanding. “Our mission is to build empathy and respect in community through honoring all of our true stories. Watch samples from performances here. True Story Theater is also available to draw people out at weddings and other such events. Roma families (also called gypsies, tinkers or travelers) have a hard life in Europe. Recently, Elisabetta Povoledo wrote at the New York Times about some Roma women who are hoping to build a better life for their families by starting food businesses. “On a muggy July evening, a handful of Italian hipsters milled around a food stand at an alternative music festival in Rome, trying to decipher some of the exotic offerings: mici, sarmale and dolma. 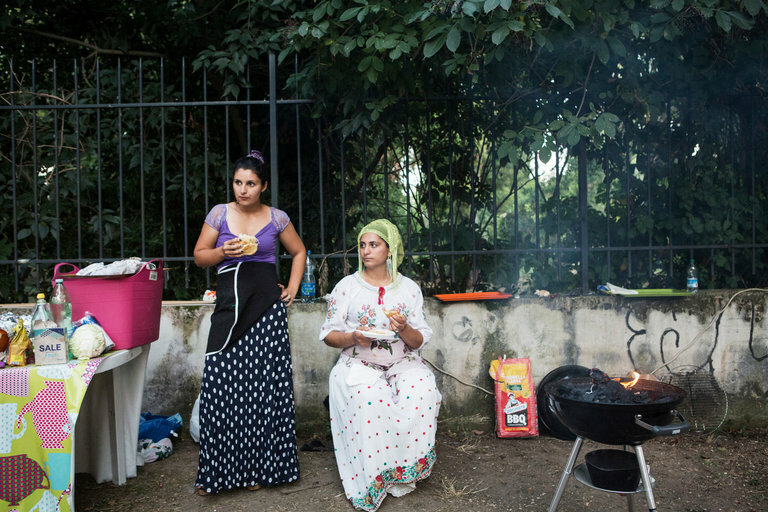 “These Balkan delicacies — barbecued meatballs, cabbage wraps and stuffed peppers — are the basic ingredients of an entrepreneurial scheme cooked up by a group of Roma women looking to better their lives and leave the overcrowded and insalubrious camp in Rome where they currently live. “They call themselves the Gipsy Queens. “If their entrepreneurial plans pan out, the Gipsy Queens hope to buy a food truck or rent a kitchen on a more permanent basis — foundations for steady work that will bring in rent money. “The oldest member of the group, Mihaela Miclescu, 49, who is a grandmother, was happy to join the Gipsy Queens. Maria Miclescu, left, and Codruca Balteanu at a food stand run by the Gipsy Queens during a music festival in Rome.